This compact, battery operated trickle-compatible scale offers a maximum reference measurement of 1500 grains. 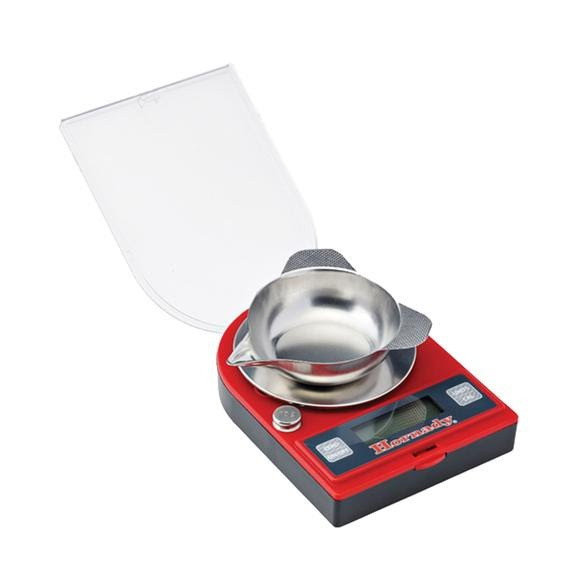 Unlike other scales on the market, it features a precision load cell with 1/10th grain accuracy and constant readout up to 500 grains, offering the flexibility to trickle powder into the pan or weigh charges, bullets or case weights directly. This compact, battery operated trickle-compatible scale offers a maximum reference measurement of 1500 grains. Unlike other scales on the market, it features a precision load cell with 1/10th grain accuracy and constant readout up to 500 grains, offering the flexibility to trickle powder into the pan or weigh charges, bullets or case weights directly. You can trust this scale to make quick work of your most precise handloading tasks. Includes two AAA batteries.